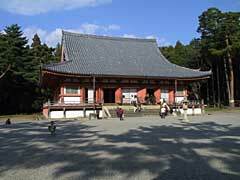 When a Buddhist priest "Rigen-Daishi" Shobo climbed a 450m-high hill, that is now called Daigo-yama or Mt. Daigo, in the year 874, the god of the hill appeared and drank water from a well then said "Daigomi naru kana!" that means "It has the ultimate taste!" Shobo drank same water and got inspiration so that he built a hermitage on the top of the hill and placed a couple of Kan'non statues in it. 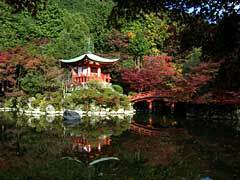 This is what the tradition says as the origin of Daigo-ji temple. NOTE: Daigomi literary means taste of Daigo, the ultimate essence of milk. As a Buddhist term, it means ultimate teaching. As a modern Japanese word, it means real enjoyment. Daigo-ji, one of the main temples of the Shingon school, is a member of World Cultural Heritage of Kyoto and has a couple of national treasures, five-storied pagoda and the main hall. 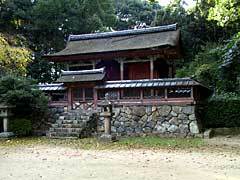 The complex consists of two levels, Kami Daigo (Upper Daigo) and Shimo Daigo (Lower Daigo). The following photos are those of Shimo Daigo and taken Nov. 16, 2001. 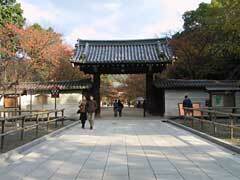 Niomon gate of Daigo-ji, rebuilt in 1605 by Toyotomi Hideyori (1593-1615), a son of Hideyoshi. 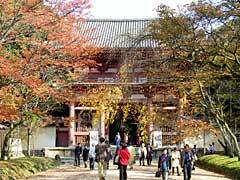 Kondo or the main hall of Daigo-ji. The original hall was built in the year 904 but was set fire and burned down in 1295. Present hall, a national treasure, used be the main hall of Mangan-ji temple in Yuasa, Kishu (present day Wakayama prefecture) and was moved to this temple by Hideyori. Seiryu-gu, an Important Cultural Property. The present building was rebuilt in 1599 by the head priest Gien. 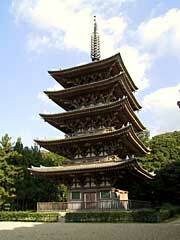 Pagoda of Daigo-ji, built in 951 AD, the oldest building in Kyoto and a national treasure.